Hello, lovelies~ Last week, I went to Taman Anggrek, a mall in West Jakarta, for a blog-related meeting. Anyway, while I was there, I stopped by the Tony Moly store to find that they were having a ' Buy 1, Get 1' promotion until the end of September. I bought a couple of things and this mask is one of them. The sheet mask packet has a picture of a female model along with the whitening claim from the capsule essence from their Floria skincare line. To be honest, I was quite surprised to see that it didn't contain any Alcohol or denatured Alcohol since most sheet mask do have that in their ingredients. The plant extract is high on the list, so I'm reassured that it has quite a lot of those. It still contains fragrance, but it is the last ingredient, so I'm not too worried. As I opened the mask packet, I didn't find a lot of leftover essence that are usually overloaded. I just found it to be present just on the sheet mask. Oh, well. The mask isn't a perfect fit on my face, but it still manages to cover all of my face. 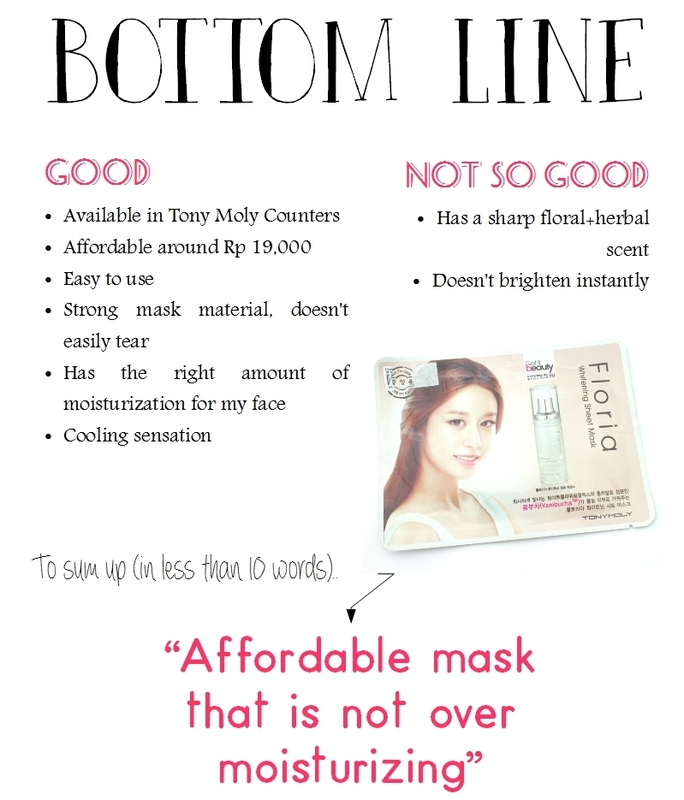 It just doesn't fold as tightly as other sheet masks. I tried to pull and tighten the ends, just to make it stick neatly. On my face, it has a cooling sensation with a combination of floral and a hint of herbal scent. It's not my favorite when it comes to scent as it lingers as I was using the mask. Maybe if you're into scents, you'll find it relaxing, but it's just not my preference. I leave the mask on my face for 10 minutes because more than that usually breaks me out, no matter what mask I'm using. Since I've only used the mask once, I couldn't really see the whitening effect on my face. 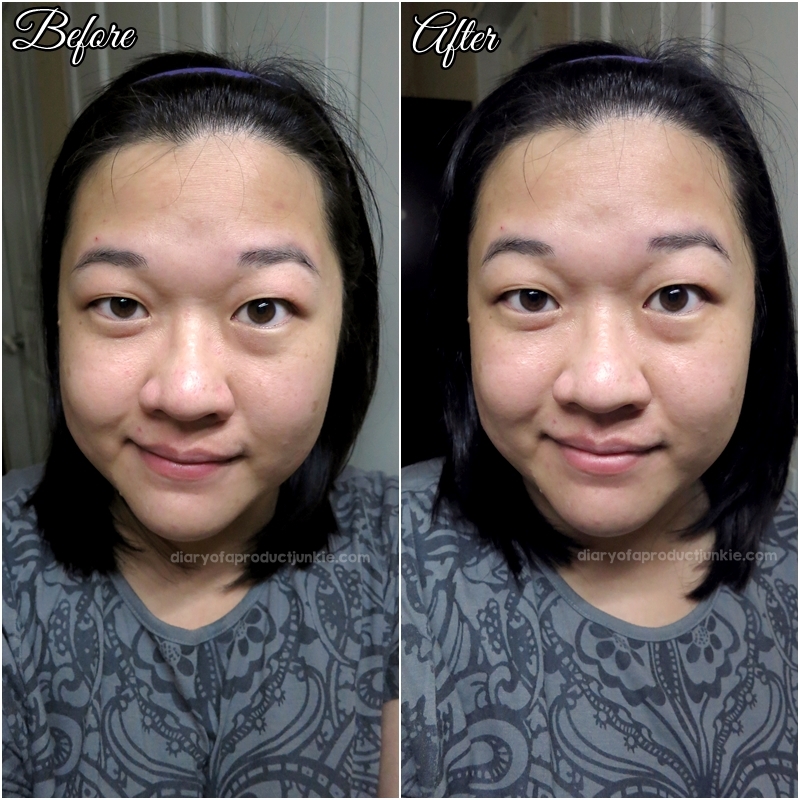 However, I have to say that it moisturizes my face adequately, leaving my face looking dewy and healthy. It doesn't feel sticky after I use it. Priced at Rp 19,000 for 2 pieces (promotion price), I would repurchase the mask again because it didn't break me out, left my face supple and has a non-sticky finish. I always find sheet masks relaxing to use, especially after a long week of work and stress.